He had me at "Good." 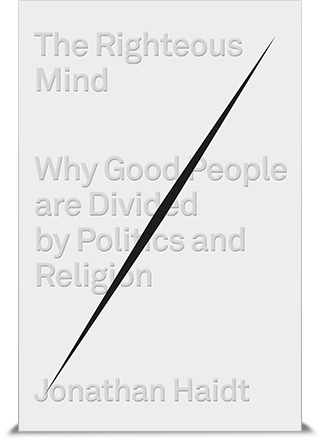 As in, good people are divided. As in, this is not yet another book about how "we" are right and "they" are wrong. an explanation of conservative and progressive views on the six key "moral foundations"
For another useful perspective, read the article "Accept Them as They Are" by Rick Hanson: "Accepting people does not mean agreeing with them... You may not like it, you may not prefer it, you may feel sad or angry about it, but at a deeper level, you are at peace with it." What (Arche)Type of Teacher Are You? To subscribe to the Mindful Teachers monthly newsletter, email 'subscribe' to mindfulteachers[at]gmail[dot]com. What Does the Bible Say About Mindfulness and Compassion? Content and logo copyright 2012-2019 Catharine Hannay. Awesome Inc. theme. Powered by Blogger.